This book goes together with Principles of Creature Design: Creating Imaginary Animals and are released around the same time. I can finally understand why the books were postponed for so long after being listed on Amazon in early 2013. These two books are just packed with so much artworks! Wow! 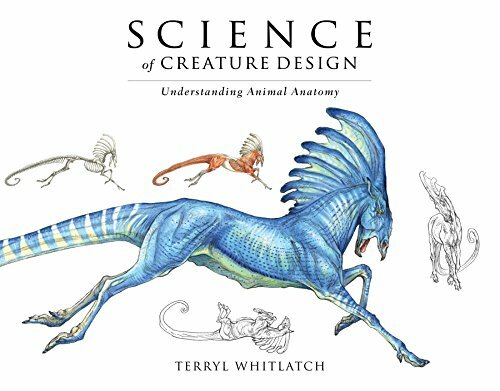 Terryl Whitlatch is probably one of the more well known creature designers around. The creatures that she draws are just a pleasure to look at. Science of Creature Design is sort of like an instructional book. I say sort of because there aren't any drawing tutorials. The instructions you get are in the form of short descriptions that accompany the drawings of real life animals, fictional creatures, their anatomy structure such as bones and muscles, and sketches. There are some tips mentioned in the chapter introductions but most of the other text are really just descriptions describing the visual aspect the animals you see on the page, there aren't any instruction on how to actually draw them. Highlight of the book is easily the artworks. The drawings featured are gorgeous. With the anatomy cutaway drawings, all the parts of the creatures are label. It's really inspiring to look at the amount and quality of work featured. This 164-page book is available in paperback and hardcover. Binding for the paperback is good. Overall, it's a beautiful book. The downside is it's lacking when it comes to techniques and explanation.